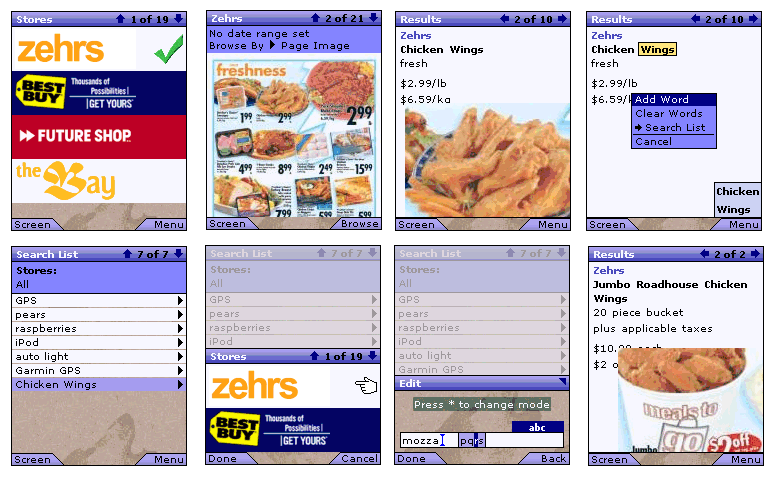 It is with great pleasure that I announce the start of the FlyerApp Trial. 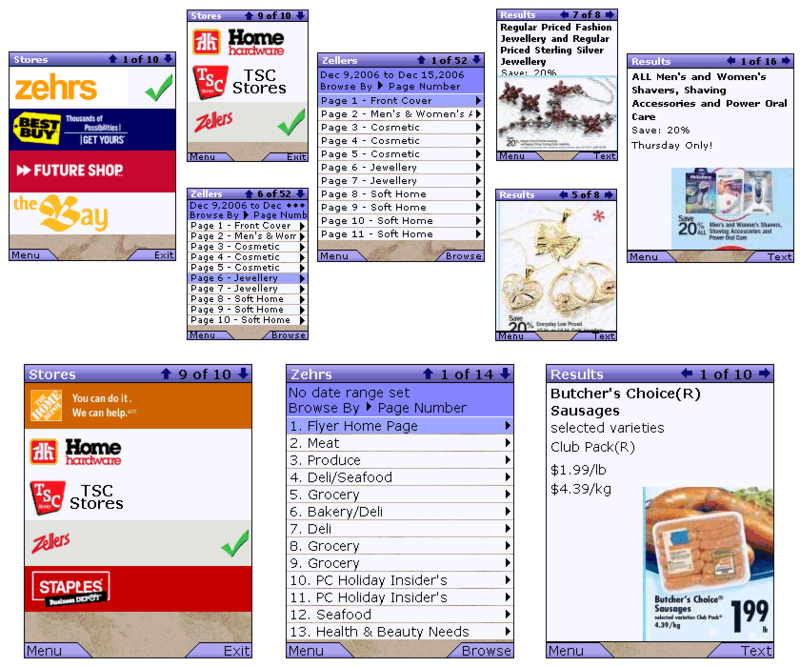 There are 2 separate versions of the product which surprisingly runs on a huge variety of devices; for details about which version to use read (A) and (B). You will also need a data plan for your device (C). 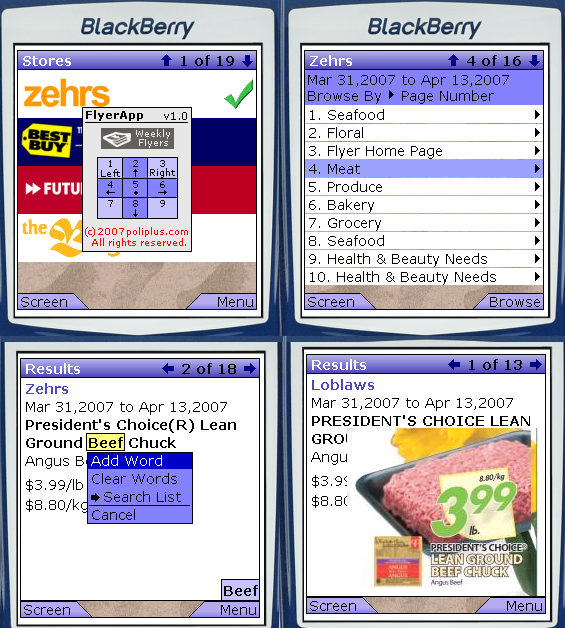 1 - Type app URL onto device's wap browser and follow screen instructions. 2 - Use a web site from your service provider to send an SMS to your phone with the URL. For a list of Canadian wireless provider web-to-SMS URLs read (D). Please feel free to let other people know about the trial. We only need their email addresses so that we can keep you all up to date with the latest and greatest. As always we welcome any comments and suggestions about the service. If the app seems slow and it's having a hard time keeping up with the intermediary animations, turn them off by going to the "Stores" screen and pressing "Menu->Settings->Disable Anim". Please let us know which device you are using and whether or not it is working properly. 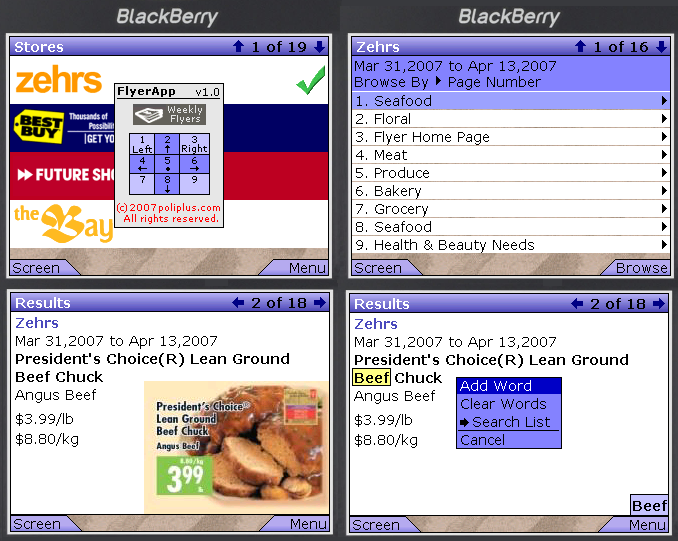 Supported Blackberry series include 77xx, 72xx, 75xx, 71xx, 87xx, 8100 (Pearl) and 8800 (not tested yet but should work). 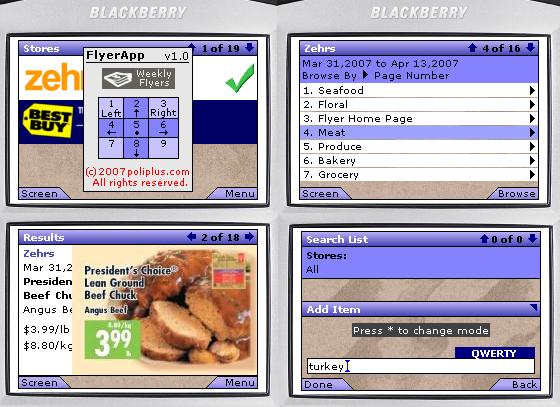 FlyerApp was designed initially for cellphones so its navigation is via the 4 directional arrows, select button and 2 softkeys. We have mapped these keys to the numeric cellpad so you must use that instead of rollerwheel. On Pearl you can use trackball but softkeys are only available on numeric cellpad. Since the cellpad has this extra overlay on it, when typing text you must press * to change modes. 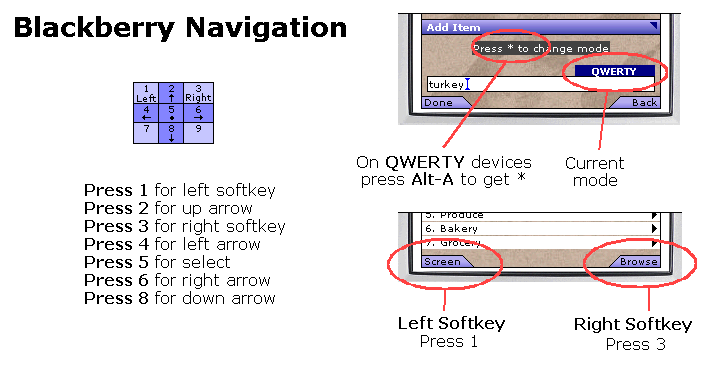 On QWERTY devices, * is reached by pressing Alt-A. The trial software for cellphones will not run on Bell Mobility because the download is blocked as it is larger than 100K. The Blackberry version might run because it is broken into 3 smaller pieces.